This recipe for Instant Pot pork chops uses fresh bone-in pork chops and just some basic seasonings to make a delicious, tender and juicy meal that’s super easy to make. For this Instant Pot pork chop recipe, we’ll give it a good rub with some very basic seasonings – salt, pepper and brown sugar. After the pork chops are well seasoned on both sides we add some oil to the Instant Pot and add a couple of tablespoons of olive oil. A quick saute on both sides for about 2-3 minutes each will great an nice golden brown color. Then we remove the pork chops from the Instant Pot, add some chicken broth and liquid smoke, scrape the bottom with a wooden spoon. This is called deglazing and adds greatly to the flavor. Place the pork chops directly in the liquid, close up the pot and pressure cook for 10 minutes. That’s it! Let the pressure naturally release for at least 10-15 minutes and you’re ready to enjoy. 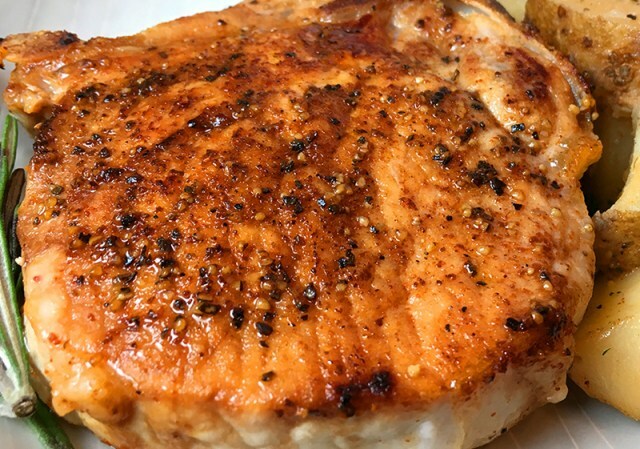 When oil is hot, brown both sides of the pork chops for about 2-3 minutes. After browning pork chops, remove from pot and set aside. and press cancel. Add chicken stock and Liquid Smoke to pot and scrape the bottom with wooden spoon. Add pork chops directly into the liquid on the bottom of the pot. Secure lid and set to pressure cook for 10 minutes. Natural release for at least 10 minutes before removing from pot and serve. 0 Response to "INSTANT POT PORK CHOPS"